Stick on a sombrero and get ready to shake maracas as you pay a visit to a Mexican town to join in on their street party celebrations. Mexicans sure know how to party and such celebrations are always colourful affairs with lots of food and drink to devour, and after you’ve filled your belly by munching on burritos and fajitas - what better way to burn off those calories than to bash candy-filled piñata’s? The Spiñata Grande video slot has been developed by Net Entertainment (NetEnt) and consists of five of the most colourful reels we have ever come across and forty fixed betting lines with players allowed to join in on the festivities by paying 20p up to a high limit of £200. An array of colourful piñatas await their bashing including those shaped like a zombie, star, bull, donkey, parrot and fish, and while you may work up a sweat and feel tired after a little while from all that bashing, it pays to fight through the pain barrier and keep on swinging as there is a top prize of 120,000 coins on offer at this vibrant street party. To help you leave the street party with more than you arrived with you’ll see Colossal symbols (a block of 2x2 or 3x3 symbols), there is a Mini-Slot feature which can see the Colossal Bonus symbol transform into three, six or nine mini symbols and there is also an exciting free spins feature boasting Colossal Wilds which promises to give you even more to celebrate! Spinning the reels of this free Spiñata Grande slot machine always prove to be a fun-filled experience largely in part to the inclusion of Colossal symbols. If you’ve not encountered these before they are special 2x2 and 3x3 symbols which appear as an overlay on the reels. Of course, the bigger they are, the more candy will fall from them – yum, yum! The piñata designed as a slot machine is as the Colossal Bonus symbol and this is key to triggering the Mini-Slot feature while the stars are key to you triggering the free spins feature. Lots of confetti appears on the reels accompanied by a catchy Mexican tune whenever you create winning combinations in Spiñata Grande and none see you rewarded as highly as the bull as it’s worth up to 300 coins. Donkeys bring smashing wins of up to 200 coins, parrots are worth up to 100 coins, fish offer up to 60 coins and there are also Ace to 10 symbols which have been designed in different colours and these are worth the least of all. This is a unique feature that you’re going to absolutely love. Once the Colossal Bonus symbol (the slot machine piñata) appears on the reels the Mini-Slot feature will begin with the symbol transforming into either three, six or nine mini symbols depending on how much of the symbol is in view. During the base game the mini symbols which can appear will either be a bronze coin that is worth 20 coins, a silver coin that is worth 40 coins, a gold coin that is worth 80 coins, a free spins symbol or an extra spin symbol, however the mini symbols you see change if you trigger the feature during the free spins game. 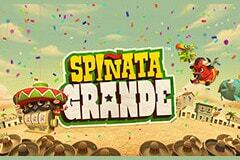 The free spins feature in Spiñata Grande begins whenever you land three of the free spins symbols (star piñatas) in the Mini-Slot feature. This feat sees you receive five initial free spins with every ‘Extra Spin’ symbol that appears seeing an extra spin added to your counter. As if that wasn’t enough, the free spins game sees the introduction of the Colossal Wild, which is a piñata that has been designed as a zombie, and this is a 3x3 symbol which can substitute for all symbols aside from the Colossal Bonus to help you smash up the reels and claim huge wins! In my opinion, this is a smashing slot and you can play Spiñata Grande here with no download needed, but if you prefer real money online slots you should check out Casumo Casino where you can deposit with credit card, Skrill and several other methods before enjoying a fabulous welcome bonus. Just don’t swing and miss the piñatas or you’ll be the laughing stock of the party!